It's hard to believe the final night onboard Norwegian Dawn has arrived. We had purchased an Internet Cafe package for the week and we still had some minutes left. So we had time for one final check of emails printing off our boarding passes for our flights home. The Internet Cafe is located on Deck 9, and is reachable via the center staircase from Deck 8. That isn't always convenient, so we find out the secret - there is a doorway on Deck 9 (mainly intended for those that are handicapped). It is certainly easier to use that entrance than to go down to Deck 8 and then back up the staircase. After dinner, we took a final stroll outside. There were just a few people walking around on deck. Many people were putting final items in their luggage in preparation for disembarkation. We opted for early disembarkation where we carry our own bags off the ship. That meant we didn't have to get luggage outside our door by any certain time. We were already packed, so it really didn't matter. The morning of disembarkation arrived. We went up to Garden Cafe for our final breakfast. The early disembarkation would begin at approximately 8:30 AM, so we didn't have to get up too early. After breakfast, we went to our cabin, picked up our bags and headed down the elevator to the gangway level. When we got down there, the hallway outside the elevator was packed. There was no where to go - we couldn't even get off the elevator. The line was not moving at all even though the early disembarkation had begun. We were finally able to get out of the elevator, but other people weren't as lucky. We've been on many ships, but never saw such confusion and a mess. After quite some time, a couple crew members came along and organized the line. It stretched from mid-ship to aft and back around the other side of the ship. It took us until 10:00 AM to finally disembark the ship. Once outside the ship, the customs process went very smoothly and we were headed to the cabs to go to the airport. Someone had mentioned that one of the gangways wasn't operating, so perhaps that accounted for the crowds and lines for disembarkation. Hopefully that's the case since there was a lack of organization that should not be the case. Despite the lines, the crowds remained relatively patient and it didn't ruin the great cruise that we had in Bermuda. This concludes our Bermuda cruise. If there's any additional information that you might need, feel free to contact me. I suggest you consider Bermuda for one of your future cruises. Regardless of the cruise we are on, it seems that we eat many meals in the buffet. Garden Cafe is the buffet dining venue on Norwegian Dawn. We had breakfast, lunch, and dinner in the Garden Cafe several times during the cruise. Made to order omelets and waffles are available during breakfast hours along with a good selection of typical foods. For lunch and dinner there is a wide selection of hot and cold entrees including made to order pasta. Don't forget about the dessert selections including ice cream, sherbets, cookies, and sugar-free items. NCL didn't forget about the kids when designing the Garden Cafe. They have their own private kid-sized section with their own buffet line. It is stocked with kid-friendly favorites. Bimini Grill, located poolside at the Oasis Pool, is a great place to grab a burger, grilled chicken, hot dog, and fries. The advantage over Garden Cafe is that you don't have to adhere to any dress code. After you are done with your burger and fries, stop by at Sprinkles Ice Cream Bar which saves you a trip to the Garden Cafe. We aren't sushi or tapas fans, so we didn't try Salsa Tapas Bar or the Sushi and Sashimi Bar during our cruise. Both of these venues were pretty busy each night, so it would appear that those that eat there were enjoying the food. For those that want main dining room service, there are two choices onboard the Dawn: Aqua Main Dining Room and Venetian Main Dining Room. We didn't eat at either of this on this cruise, but have eaten at them in the past. A couple things to note are the menu doesn't change during the cruise and both of the main dining rooms have the identical menu. You'd want to be sure to include other dining choices during your cruise or you would most likely be disappointed. We also didn't eat at Bamboo - A Taste of Asia since we opted for Teppanyaki instead. The menu did look appealing but we simply didn't have enough time to eat everywhere. We did have one disappointment one evening. That was at Blue Lagoon. We had eaten there on Norwegian Pearl and enjoyed the meal. This time I ordered Fish 'n Chips and was looking forward to it (based on my past experiences). It was perhaps the worst fish that I've ever eaten. It seemed to be overcooked or simply a poor quality of fish. I looked around at others that had ordered it and they too had similar looking fish, so I didn't bother to send it back. On a positive note, the tomato basil soup was excellent. So my advice to you would be to check to see what people have ordered before placing your order. If all of the choices I've described in the various posts aren't enough for you, there's always room service. We were never in our cabin long enough so I'm unable to report on that option. I hope that you've enjoyed the information about the Norwegian Dawn Bermuda cruise. In my next post, I'll cover any miscellaneous items and disembarkation. One restaurant that we didn't actually try was Le Bistro French Restaurant. When you walk through the doors of this French restaurant, you might believe that you are in a charming French hotel. The walls are decorated with the art of Monet, Van Gogh, Matise, and Renoir. The menu consists of modern classical and contemporary French gourmet dishes. As you would expect, there is an extensive selection of fine French wines to complement your meal. While we didn't personally experience the Norwegian Dawn's interpretation of French Cuisine, several passengers that we spoke to did and thoroughly enjoyed the meal and experience. Again, there is an additonal charge for Le Bistro French Restaurant and you'll want to make reservations so that you won't be disappointed that you are unable to dine there. Our final night aboard the Norwegian Dawn, we made a reservation for Impressions Italian Restaurant which is located on Deck 6. We met another couple who had dinner with us earlier in the cruise and invited them to join us. The menu is traditional Italian which includes pasta dishes, seven different sauces to choose from, steak, veal, chicken, and other dishes. Crispy fresh salads, pizza, and authentic Italian desserts complete the offerings. Our waiter was very accommodating. Our son couldn't make up his mind between the veal parmigiana and the Italian steak - so the waiter brought both of them. He did finish both of them so needless to say he enjoyed his meal. The other couple that joined us for dinner were celebrating their wedding anniversary. The wait staff sang to them and brought an anniversary cake. It was a very lovely evening. As with the other freestyle dining options, there is an extra charge. I'd recommend adding Impressions to your list of restaurants to try assuming that you enjoy Italian food. I hope you are enjoying your virtual tour of our Norwegian Dawn cruise to Bermuda. So far, I've discussed our first days onboard the Dawn, the various Bermuda attractions that we saw on this cruise, and some of our onboard experiences. As we sail away from Bermuda, back to New York, the good times are not over by any means. We still have two nights with a full day at sea before we return to New York. So, let the party begin! I don't know about you, but one of the other highlights of traveling is the possibility of enjoying a nice meal in a restaurant that wouldn't be found in my hometown area. You might be thinking, that's pretty easy to accomplish when you're on a cruise ship. None of those restaurants will be found in your hometown. Ok, you got me there. Humor me for awhile as I search out our dinner venue. Just like you might do in a popular dining area, you go from restaurant to restaurant, checking out the menu before making your selection. As I've mentioned in an earlier post, there are many choices onboard the Norwegian Dawn. All the menus are posted so you can go "shopping" for your dinner choice. Once you've made your selection, you can make a reservation (either for the same night or the next). We made a reservation for Cagney's Steakhouse. This isn't the first time we've gone to Cagney's onboard a NCL ship, so we were already familiar with the menu and the atmosphere. Cagney's is decorated like a speakeasy from the Roaring 20's. There are various size tables to accommodate your group. After being escorted to our table, our waiter greeted us and took our drink order. He answered our questions about the menu and disappeared to get our drinks. As you probably suspect, the meal consists of several courses. You can have as many of the selections as you like. Click on the menu above to see all the choices. The starters we had included the jumbo shrimp cocktail, and salads. There are several main course selections that you can chose from. These range from a 10 ounce New York Steak to the 32 ounce Porterhouse Steak. If you don't want steak, there are several fish selections, veal, and even a vegetarian selection. We have a theory that hasn't failed us over the years. If you go to a Steakhouse, order steak. If you want seafood, go to a Seafood restaurant. In this case, you wouldn't go wrong with any selection. We chose the New York Steak and T-Bone Steak - both of which were fabulous. To complete the main course, you can add as many side orders as you like. Our selections included sauteed mushrooms, onion rings, Cagney's Fries (you've got to try those if you like fries - they are made with white truffle oil and Parmesan cheese), and mashed potatoes. There were three of us dining together, thus the large selection of sides. You get your own order of Cagney's Fries and you tell the waiter which of the remaining sides you want him to serve. Assuming that you still have room, the waiter will present the dessert selections for your final choice of the meal. We definitely left Cagney's feeling very content. As with the other specialty restaurants onboard Norwegian Dawn, there is a cover charge added to your account. It is $20 per person, but is well worth it. The attentive staff, the nice atmosphere, and the wonderful food made for a very enjoyable meal. Where could you get a steak meal like that for $20 in New York or wherever home is? If you were only going to one specialty restaurant during your cruise, I would definitely put Cagney's on your short list to consider. Now that dinner is complete, we're off to a show. See you next time. If you have cruised before, you know that the casino and onboard shops are closed while in port. So, on most cruises, by 5 or 6 PM, the casino is open and shops are open. This is not the case while in Bermuda, since the ship docks at King's Wharf and stays there for two nights before moving to Hamilton (on this particular cruise). So does that mean there's nothing to do at night while in Bermuda? Of course not !! Both onboard the ship and onshore, there's plenty of activities going on. Hamilton's Front Street is the hub of activity both during the day and also at night. If you decide to go to Hamilton, make sure you are aware of the transportation schedule, so you don't have difficulty getting back to the ship. For example, the last ferry from Hamilton back to Dockyard is at 11 PM. You'll not want to miss that ferry if that's your means of transportation. Check the Public Transportation Board website for schedules. Staying closer to the ship, there are the local pubs in Dockyard. On both nights there was a beach party going on at the Dockyard. Just follow the signs or the crowd if this interests you. The party continued until the wee hours of the morning. If you don't want to venture out at all, there are still plenty of activities onboard the ship (even with the casino being closed). On the first night the activities included South Beach Rave in the Stardust Theater. This show, featuring the Jean Ann Ryan Company, was a high energy show with music provided by the Norwegian Dawn Showband. Starting at 10:15 PM, there was Dancing Under the Stars, at the Oasis Poolside, with dance music provided by Upryzin'. The Friendly Family Feud Game, Late Night Adult Comedy and the Music of Neil Diamond were other activities the first night in port. For those that want to be a performer, Karaoke was also going on in Dazzles Lounge. The second night in King's Wharf featured Second City in the Stardust Theater and Adult Comedy in Spinnaker Lounge. If you've never seen The Quest Adult Game Show, you might want to check that out in Spinnaker Lounge. This was the night for the Chocoholic Buffet in the Garden Cafe. Take pictures or sample some of the fantastic chocolate treats. Unfortunately, we got back late from our Night Snorkel excursion, so we missed most of the festivities. Since we sail from Hamilton before dinner, shops were open, the casino opened, and there were plenty of venues to attend for entertainment. As you can see, there's always something to do in the evening, despite some ship services being closed while in port. So you are free to do whatever. Our first port of call in Bermuda was King's Wharf, also know as the Royal Naval Dockyard. The stone walls of this old dockyard have been transformed into various shops for you to explore. For example, the Bermuda Arts Centre houses displays of local art including paintings, quilts, costume dolls, jewelry, and wood sculpture. The Cooperage, also at the Dockyard, is an ideal place to shop for island-made handicrafts. In the Clocktower Mall, you'll find a wide selection of products including souvenirs, fashions, gifts, arts and crafts, books, and jewelry. Inside the Bermuda Clayworks, you'll find pottery including house signs, lighthouses, and plates. If you don't want to take your purchases with you, they can provide overseas shipping. The Dockyard Glassworks are manufacturers of high quality hand-made art glass. You'll find plates, angels, sailboats, bowls, angel fish, dolphins and much more. Each piece is unique and has been inspired by the natural beauty of the Bermuda Islands. Free, working demonstrations are held every day except Saturday. 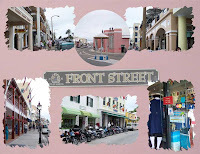 Hamilton is the shopping district of Bermuda. All along Front Street you'll find several unique shops to browse. There are imports from Great Britain and Ireland such as English woolens, Harris tweed jackets, Irish linen, china, island-made jewelry, local crafts made of Bermuda cedar and local products. Don't forget to purchase some Bermuda Shorts for the rest of your trip. The major stores and smaller boutiques carry a range of cosmetics and perfumes, some of which are available at prices less than in their country of origin and there’s no sales tax! The price you see is the price you pay. Another convenience offered in many stores is overseas shipping. These two shopping districts are the major locations you'll want to visit for your main shopping trip. Several attractions, such as the Bermuda Underwater Exploration Institute, and Gibb Lighthouse also have gift shops for you to explore. Shopping while on a cruise has many advantages. You can find unique gifts for friends and family. You can even get an early start on your holiday shopping. Prices on certain items may be considerably lower than other locations. In Bermuda, there is no sales tax. Items can be purchased duty free up to your allowances (this is where your children can save you money - the allowance is per person, including children). Even if you go over your allowance, you may still come out ahead. Since the Bermuda Dollar and U.S. Dollar are equal, you don't lose money on the conversion. Have you ever considered starting a collection which you build during your vacation trips? What a great way to relive your cruise vacations as you look at your collection as it builds. There are several options that can easily be transported home such as spoons, pins, ornaments, thimbles, patches, key chains, and magnets. Read more about starting a collection while cruising. So, your feet are tired; you've shopped till you dropped. I hope you've gotten everything that you were looking for in Bermuda. If not, fear not - one hour after sailing from Bermuda, the ship's stores will be open and you'll still have another chance to find that perfect gift for someone. Happy Shopping. It's time to say good-bye to Bermuda as we sail from Hamilton towards New York. There's still another day at sea before returning to our hope port of call. Step back in time to the 1870s where atop a hillside overlooking Hamilton Harbour, a pentagonal fort was built to protect against a possible attack by American forces. Fort Hamilton is about three or four blocks from the BUEI so it didn't take long for us to walk there. Entering through a narrow driveway, the first thing we saw was a well maintained garden. Along the perimeter of the garden are ramparts and cannons. When you walk to the highest point, you can see why this location was an excellent choice for guarding the harbour. There are spectacular views of the cathedral and the ships in Hamilton Harbour from this vantage point. As we arrived at the fort, it began to drizzle a little, but it didn't last long. We weren't the only people that had come from our ship. We met two other couples that were enjoying the beautiful gardens. After taking pictures of each other, we proceeded to tour the garden moat, which is the best kept secret of the fort. The 30 ft wide dry moat which surrounds the fort has been transformed into a woodland garden. Along the winding path you'll see many species of vegetation including soaring bamboos, palms, palmettos and allspice trees. There are plenty of passage ways for you to explore along the way. Dimly lit corridors and stairways lead to walkways inside the fort. Ammunition was stored deep inside the fort and the shells were hoisted to the surface by ropes. We spent about an hour at the fort and that was plenty of time to explore at a leisurely pace. There are benches in several locations where you can rest and enjoy the peacefulness of the beautiful gardens. We were truly glad that we made the walk up the steep hill to the fort. For those that don't want to walk to the fort, I'd suggest taking a taxi there. There is no admission charge to Fort Hamilton. It is one of the best bargains in Bermuda. From the fort we walked down Front Street, the main street in Hamilton. There you'll find all the shops. 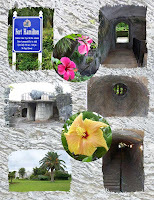 View my Fort Hamilton Album and then come back to read about shopping in Bermuda. It's day 3 in Bermuda and time for the Norwegian Dawn to make a short journey from King's Wharf to Hamilton, Bermuda. The ship tenders in Hamilton, so it was necessary to obtain tender tickets before going ashore. We decided not to rush and had some breakfast. When we finished our breakfast, we headed to the lounge to pickup our tender tickets. Timing couldn't have been better - we were able to obtain our tender ticket and head to the gangway to disembark. Our tender boat was actually one of the ferries, so it was able to accomodate a large number of passengers waiting to go ashore. Once ashore we began walking down Front Street, the main street of Hamilton. We weren't exactly sure where the Bermuda Underwater Exploration Institute (BUEI) was located, so we asked a women walking along the street. We were only three or four blocks away from the BUEI. If you don't want to walk, you can also get to the BUEI by bus. 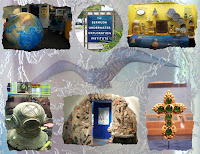 We spent two hours there visiting the various exhibits such as Bermuda Revealed, Underwater Bermuda, Shell Collection, Science at Sea, The Dive, The Deep, Bioluminescence, Shark Cage, Treasure Room, and the Shipwreck Gallery. Once again our timing was excellent. By the time we walked to The Dive exhibit, the ride was about to begin. If you've been to a theme park and gone on a motion ride, this is very similar. We were actually the only people on the ride. There is a wealth of information throughout the various exhibits. One could easily spend several hours going through the institute, especially if that was their are of interest. 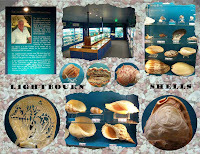 Even if marine biology and underwater exploration isn't your favorite subject, I think you will enjoy the Lightbourn Shell Collection. The collection is housed in several display cases. Jack Lightbourn started with Bermuda shells and expanded it to the entire world. It is by far the most amazing collection of shells we've ever seen. For more photos, see our BUEI Photo Album and Shell Collection Album. When we left the BUEI, it started to sprinkle a little, but it wasn't enough to keep us from going to our next stop, Fort Hamilton. My next post will describe our visit there. Do fish swim at night? Are fish active after the sun goes down? Do fish have their dinner when we do? Have you ever wondered about things like that? If so, then perhaps a Night Snorkeling excursion could answer those questions for you. When reviewing the possible excursions available on the Norwegian Dawn cruise to Bermuda, we were intrigued by the Night Snorkeling excursion offered while we were in King's Wharf. A ratio of one instructor to six snorkelers ensures your personalized attention and safety. You'll see a variety of sea creatures that normally hide during the day and marvel at how the beautiful coral formations come alive in our beams of light. 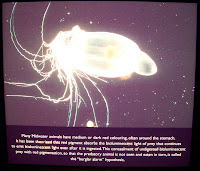 Then for a real treat we turn off our lights to discover the extraordinary effects of bioluminescence microscopic creatures that create light as we swim through them. Experience a whole different type of Bermuda nightlife. Note: Participants under 18 years of age must be accompanied by an adult. All participants must know how to swim. This tour is not recommended for those with limited mobility and back problems. After reading that description, we had some preconceived notions about this tour. We expected to be snorkeling off of a boat that provided the lighting. It turned out that we would be providing our own lighting using underwater flashlights. Our tour began with a short taxi ride from the pier to 9 Beaches Resort. After a short briefing, we were given our gear which included partial wet suits, snorkel mask, snorkel, fins, life vests, and a flashlight. We were paired into groups of two swimmers and given one glow stick which would serve as a locator in the dark. After everyone had their gear, we entered the water from the beach near to the equipment shack and made sure that our masks and snorkels were working and adjusted properly. I was a little leery, despite having snorkeled before, we never had done so at night. Most of our snorkeling was done by jumping into water from a boat which was anchored nearby the snorkeling area. That gives you the opportunity to rest for awhile and rejoin the snorkeling when you want. This was obviously not going to be the same experience. The tour guides assured me that we'd stay together and make frequent stops to be sure the group was together. He also said that I could stay close to him if that helped. Unfortunately, he took off and staying with him wasn't really practical. My husband stayed with me and that had to suffice. The water was cold despite the wet suit. We did make several stops to keep the group together. I only saw a couple fish the whole time. My husband didn't see any at all. He was too busy keeping tabs of where my light was and where I was. Our son was with us too and he did see a few fish. I started to get a cramp and decided that I'd had enough. A few of us got out near a landing and walked back to the equipment shack. The rest of the group continued for 15 or 20 minutes more, so we could have made it the whole time, but I didn't want to risk it due to the cramps. Some people might enjoy this tour, but we weren't very happy with it. The description was misleading to us and the tour guides could have been more sensitive to the abilities of the group. If you are good swimmers / snorkelers, you might enjoy this experience. For us, we'll stick with day-time snorkeling. Even though we had underwater cameras, we took no pictures, so I have nothing to share with you from this tour. Do come back next time for some of our other activities in Bermuda. Step back in history to the 19th century. Walk through the entrance of the Keep and imagine the life of a British Naval Officer as they saw your ship approaching. Orders rang out to man the cannons. The Royal Naval Dockyard, built starting in 1809, remained a major Atlantic outpost for the British Royal Navy until 1951, when most of the facility was closed. A limited number of buildings and facilities remained opened for the support of British and NATO ships until complete closure in 1995. This location has been transformed into one of Bermuda’s most popular tourist areas. The former Keep became the Bermuda Maritime Museum and Dolphin Quest, while the Royal Navy’s administrative headquarters are now a shopping centre, the Clocktower Mall. 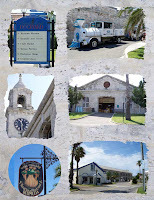 The Cooperage, originally used for making barrels, is now home to the Frog and Onion Pub, the Bermuda Art Centre, the Bermuda Craft Market and the Neptune Cinema. Buildings previously used for repair work now house the Bermuda Clayworks and Dockyard Glassworks. Upon return from our sightseeing in Hamilton, we entered the old Keep to begin a self-guided tour of the Maritime Museum. Scattered around the grounds are ship's propellars, anchors, and other maritime artifacts. The cannons, which have been silent for years, still point out into the harbor as if they are still standing guard. The view from various parts of this old fortress is amazing. In the picture above, you can see our ship, the Norwegian Dawn, as seen through one of the lookouts. Stand behind one of the massive cannons and imagine that you were here in the early 1900's. Continuing your walk around the perimeter of the old Keep, you'll come to Dolphin Quest. From your vantage point, you may be lucky enough to see the dolphins with their trainers or some of the tourists that have chosen a dolphin encounter as part of their vacation. There are three different encounter programs available at Dolphin Quest. If you never swam with the dolphins, this could be a once in a lifetime experience for you and your family. I'll warn you though, it is quite pricey. From our vantage point, it looked like the dolphins and people were having a great time. Snorkel Park is a new attraction at the Royal Naval Dockyards. It can be seen from the Keep as you walk through the grounds. While it is convenient to the ship, I'd probably select Horseshoe Bay or one of the other popular beaches instead of this one. Make sure to visit the actual museum building in the center of the Keep to see various displays. For more pictures, see our Dockyards Photo Album. 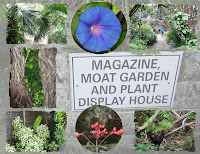 There are still more Bermuda attractions for me to discuss, so come back and visit again for more updates. If you weren't human, would you want to be a fish? What if you could talk to a fish and ask them if they had a good life? Sounds a little fishy to you perhaps. Well, once you meet Greg Hartley, the owner operator of Hartley's Undersea Walk Bermuda, you might think that he and his family had these strange thoughts many years ago. He calls each fish by name and they eagerly come to greet him as he enters the water with his guests. Greg's father started the family business over 50 years ago. He invented what is known as the Hartley Diving Helmet. It works like a glass turned upside down in water. There is a constant supply of fresh air pumped from the boat and the excess bubbles freely flow out the bottom. Your head stays dry and you can reach in to touch your face or adjust your glasses. You can even wear your prescription glasses or contact lens. 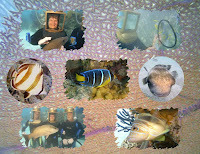 The helmet dives occur on the same reef every day and the fish have become used to the visitors. Some of the fish are so tame they'll let you pet and hold them. They might even do tricks for you (such as swimming through a hoop). They pose for underwater pictures with you and your companions. For a small fee, Greg will take digital photographs of you and your companions during your underwater sea walk. You'll have a copy of your pictures on CD, along with some marine pictures that Greg and his family have taken over the years, to take home with you as a lasting souvenir of your adventure. The great thing about helmet diving is that you don't need to be certified or even be able to swim. Greg leads you around the sandy bottom in about 10 feet of turquoise water, between coral reefs and waving sea fans as tropical fish swim all around you. With Greg's various props, he actually instructs you as he points out the various marine life. Our first helmet diving experience was actually in Tahiti. Since we had enjoyed that experience, we put Hartley's Helmet Dive on the top of our must do activities for our Bermuda cruise. You can purchase your tour through NCL or directly with the Hartley's. Since the ship's excursion was in the morning, we decided to book that tour instead of doing it directly with Greg. Both our helmet diving experiences were fabulous adventures. Of the two, we liked Greg's tour better since it was educational in addition to being recreational. He and his family have a deep love and respect for the eco environment and strive to educate each visitor. With people like Greg providing these tours, we hope that the reefs will stay protected so that many generations will be able to enjoy their beauty. I encourage you to check Greg's website for more information about the undersea walk. It is fun for the entire family, for young and old. Remember, no special skills are needed. All you need to be able to do is walk and follow directions to have a great time. This tour was one of the highlights of our Bermuda cruise. I strongly encourage you to consider this tour while in Bermuda. There's still more to come, so be sure to visit my blog again.